The Chinese Qualifier for DreamHack Masters Dallas 2019 started off today with 8 teams being a part of the qualifier. The 8 participants consisted of 4 direct invites and 4 teams making their way through the Open Qualifiers. 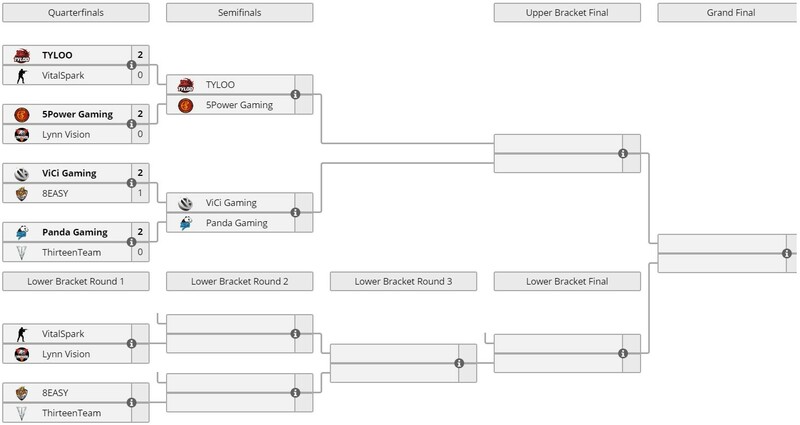 Everything was going as expected with all the directly invited tier one teams winning their respective matchups until ViCi went down to a fairly unknown team 8EASY. ViCi who has grown leaps and bounds on the back of the talented awper, Kaze and the youngster, Freeman started off well by winning the first map Inferno pretty comfortably. But the second match stomp was embarrassing for the Major attendee. 8EASY started off strong playing as CT on Overpass, stringing 8 consecutive rounds in their favour. They went on to finish ‘12-3’ at the halftime mark following which ViCi were not able to come back and lost on Overpass by a score of ‘16-5’. This could have been dismissed off as a one-time thing but the decider taking place on Dust 2 became a battle for survival for ViCi Gaming as the match went into overtime courtesy of 8EASY making a fairly difficult comeback to even out the scores. ViCi did take the win in overtime to move on to the next round but this was a really bad performance by them. Hope they can put up a better performance against Panda Gaming tomorrow. Stay tuned as we witness the first set of eliminations tomorrow along with 2 tier one teams going down to the Lower Bracket.